A walk along any high street will reveal that when it comes to interior style, pattern is very much back in vogue and the same is true of flooring and in particular, the great British favourite - carpet. However, choosing a patterned carpet is a little more complex than buying a run-of-the-mill beige twist, requiring a great deal of forethought to make sure that the carpet doesn't date too quickly or clash with existing furniture. Mention patterned carpet to some and memories of blue, green and red traditional axminster carpets will come flooding back, but modern patterned carpet is far subtler in approach. Most current patterned carpets use the foundation of natural colour palettes and the designs are there to add extra visual interest, something that has been lacking over recent years, without becoming overbearing and dominant. 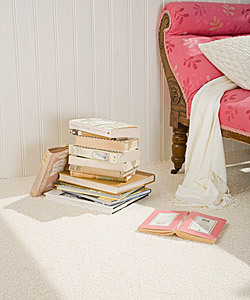 As for the designs themselves, there are two main groups that are proving popular - stripes and delicate floral patterns. Stripes are the most versatile, working both in contemporary homes as well as traditional interiors, while floral designs should only really be considered in the latter. Karastan's Jensen Stripe (www.karastan.com) uses a pinstripe combination in colours ranging from red to rustic neutrals and a pink and green combination and is woven from 100% pure wool for great comfort and durability. The combination of natural colours and a narrow stripe make Jensen Stripe ideal for contemporary interiors, while the richer and stronger colours are fitting for traditional homes. One of the best exponents of floral patterns, Axminster Carpets has a wide range of styles, ranging from the really subtle Royal Devon to the more pronounced Dartmoor Persian Dynasty, through to the enduringly romantic Royal Seaton Calico. What's right for the home really depends on to what extent the floor is to be pushed within the decor. As a backdrop use one with just two or so overall colours, to make it a feature choose one with several dominant colours. Lano carpets' Ultimo brand and its Pure Indulgence collection follows a similar path to pattern, bringing traditional carpet weaving techniques and harmonising them with contemporary pointers such as monochrome colourways and striated designs. One design certainly sticks out for its contemporary attitude and that is the stunning houndstooth pattern that adds a real sense of drama to the floor and is well suited for contemporary interiors where adventure is a big part of the style. 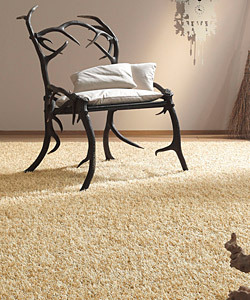 Texture can have a similar effect as subtle patterned carpet and deep lush piles are becoming increasingly in vogue. 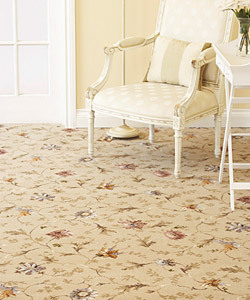 Vorwerk Carpets' Fabula style from the Fascination collection captures this perfectly. A revival of flokati, or shaggy as its called today, Fabula uses a combination of thin and long glossy threads in two shades with a shorter and thicker matt fibre in one shade to create a playful appearance that literally dances across the floor. Available in nine colours, Fabula marks a return to kitsch. All in all, patterned and heavily textured carpets are going to be big news over the course of the year and as consumers look for something that really stands out from the crowd, carpet manufacturers are well poised to bring retailers the answer. Just remember that the best patterned carpets are premium quality and will be chosen by more discerning consumers, so for those in the market of value-conscious floorcoverings, the beige twist pile should still dominate in-store.